As per team tradition, the Packers select game captains each week. Today’s captains will be WR Randall Cobb (offense), CB Sam Shields (defense) and P Tim Masthay (special teams). As per team tradition, the Packers select game captains each week. Today’s captains will be G T.J. Lang (offense), CB Sam Shields (defense) and LS Brett Goode (special teams). Packers QB Aaron Rodgers, CB Sam Shields and S Sean Richardson were awarded game balls by the coaching staff for their performances in the 38-17 victory over the Chicago Bears last Sunday. Rodgers was the offensive game ball recipient for his 302-yard, four-TD performance that featured a 151.2 passer rating. That’s the second-highest rating of Rodgers’ career and the fourth-highest for a single game in franchise history. Shields got the defensive game ball. He had an interception he returned 62 yards to set up a Packers TD in the second half, and he also broke up two other passes and was credited with three solo tackles. Richardson received the special teams game ball for his recovery of a Bears onside kick attempt late in the second quarter. Packers CB Sam Shields, who signed a multi-year contract extension just before the start of free agency, says his newfound financial security won’t change the way he approaches his craft. As free agency approached in early March, Shields said he wanted to remain in Green Bay but admitted he got “scared” the Packers might not come through with a contract offer to his liking and he’d be shopping elsewhere. He said playing with CB Tramon Williams, S Morgan Burnett and others is “like a family” and he wanted to stay. Shields credited CB coach Joe Whitt Jr. with getting him to this point. Coming from the University of Miami (Fla.), Shields switched from receiver to defensive back for his final year with the Hurricanes and came to the Packers as an undrafted rookie. He had so much trouble learning the defense that Whitt devised flash cards to quiz him on packages and assignments, and he got it down well enough to be the Packers’ nickel corner as a rookie on the 2010 Super Bowl team. Last season was almost assuredly his best, as he posted a career-high 64 tackles and tied his career best with four interceptions, including three in the final five regular-season games. He also has four postseason interceptions in his career, tied for the franchise playoff record with Williams and a handful of others, but he lost a chance to grab solo possession of that record when he left last January’s playoff game against the 49ers in the first quarter with a leg injury. That injury, originally thought to be a knee problem, ended up not being anything serious — Shields called it a high ankle sprain on Tuesday — and had no impact on his pending free-agent status. The Packers coaching staff awarded game balls to five players for their performances against the Cowboys on Sunday. On offense, QB Matt Flynn and RB Eddie Lacy were the recipients. Flynn completed 26 of 39 passes for 299 yards with four TDs and one INT for a 113.1 passer rating. He led the offense to five consecutive touchdown drives in the second half. Lacy rushed 21 times for 141 yards and a TD and added 30 yards on four receptions. He went over 1,000 rushing yards for the season, and at 1,028 he’s closing in on John Brockington’s franchise rookie record of 1,105 yards set in 1971. The rushing TD was also Lacy’s eighth of the season, already a team rookie record. On defense, CBs Sam Shields and Tramon Williams were awarded game balls. The duo combined for 14 tackles, and they each had an interception of Dallas QB Tony Romo in the last three minutes of the game. Shields’ pick, his third of the season, gave the Packers the ball at midfield, down 36-31 with 2:46 left, and set up the go-ahead TD drive. Williams’ interception, also his third of the season, came with 1:22 left and ended any comeback hopes for the Cowboys after they had fallen behind, 37-36. K Mason Crosby was the game-ball recipient on special teams. Crosby kicked five touchbacks on seven kickoffs and was good on a 57-yard FG, his fifth FG of 50-plus yards this season. The Packers appear to be getting some of their injured players back for the Thanksgiving showdown with the Lions. CB Sam Shields (hamstring), LB Nick Perry (foot/ankle), DE Johnny Jolly (groin) and OT Don Barclay (knee) — all of whom have missed at least the last two games, except Jolly, who sat out only last Sunday vs. Minnesota — are all listed as probable on the injury report for Thursday’s game following their participation on practices on Tuesday and Wednesday. The return of Shields is particularly timely, with the defense going up against the league’s most explosive receiver in Calvin Johnson, who missed the first meeting with the Packers back on Oct. 6 due to a knee injury. McCarthy wasn’t going to reveal the game plan against Johnson, but it’s a safe bet Shields will get a fair share of time against him. For the Packers’ complete injury report, click here. 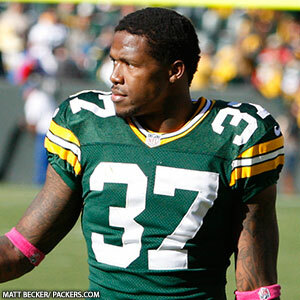 Packers CB Sam Shields missed his third straight practice on Friday with a hamstring injury and is listed as questionable on the injury report for Sunday’s game. Shields was a last-minute scratch prior to last week’s game and his recovery has been slow, but Head Coach Mike McCarthy indicated the team will wait all the way up until Sunday morning to see if Shields can play. Another cornerback, rookie Micah Hyde, missed his second straight day of practice on Friday with a groin injury but is listed as probable. Hyde was the full-time nickel back last week against the Giants with Shields out and Davon House moving into the starting lineup opposite Tramon Williams. Up front on defense, DE Johnny Jolly is doubtful with a groin injury after sitting out practice all week. Jolly has been a key run defender for the Packers this season, and his absence could be troubling against Vikings RB Adrian Peterson, particularly with DE Ryan Pickett playing at less than full strength with a knee injury. McCarthy suggested that Jolly’s doubtful status is due in part to the quick turnaround coming next week, with the Packers traveling to Detroit to play the Lions on Thanksgiving. On the offensive side, RT Don Barclay will miss his second straight game, with Marshall Newhouse starting in his place.